Conext SW 4024 Inverter Charger 120/240V. 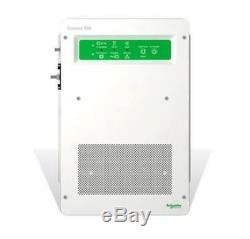 Schneider Electric Conext SW Inverter/Chargers. 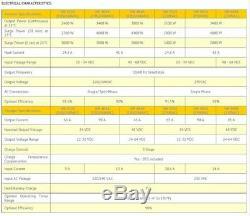 See product images for inverter specifications. Schneider Electric Context SW Inverter/Chargers have a pure sine wave output for a clean AC signal to power your delicate electronics. Economical, efficient, and light-duty, these inverter/chargers are ideal for residential use, and can be used for both an off grid solar power system, or a backup power supply. Models work with either 24V or 48V battery banks, as well as well as two voltage families - a 120/240V split phase voltage for North America, and a 230V single phase model for Europe. All models offer switchable 50/60 Hz output frequency, making it flexible to be used in island nations for example. The modular design makes for an easy installation. Flexible, economical, and user-friendly - perfect for your renewable energy needs! New value in off-grid solar and backup power. Conext TM SW delivers new value and a new price point to installers and system owners globally. Perfect for off-grid, backup power and self-consumption applications, it is a pure sine wave, inverter/charger system with switchable 50/60 Hz frequencies, providing power for every need. For expanded off-grid capacity, the Conext SW is integrated with fuel-based generators as required to support loads larger than the generators output. Its also self consumption ready, able to prioritize solar consumption over the grid, while maintaining zero grid export. The Conext SW works with the grid to avoid peak utility charges and support the grid when utility supply is limited. Accessories include pre-wired universal DC distribution panel and AC distribution panels. Stacking two Conext SW units will double the systems total output power and available solar charge controllers allow for the integration of solar capacity as required. Configures quickly into compact wall mounted system. Excellent starting power with high 30-minute and 5-second surge power. Generator Support allows power to be automatically drawn from the batteries to assist an AC generator to support heavy loads i. Loads that exceed the available current from the generator. Compatible with FLA, Gel, AGM, Custom batteries. Dead Battery Charge recovers highly discharged batteries (as low as 24 VDC). Supports AC coupled and DC coupled off-grid and grid-tie architectures. Intelligent functionality enables self consumption with solar prioritization, peak shaving and, assisting small generators with heavy loads. Companion switchgear integrates inverter with battery bank and solar charge controllers, making installation easy. Stackable - stack two units to double output power up to 8 kW. Field-selectable frequency - models support both 50 Hz and 60 Hz output. AC Load Power Share prioritizes AC loads by reducing the charge current and maintaining the total input current to less than the breaker setting. Search Mode allows the inverter to selectively power only items that draw more than a certain amount of power, which can result in power savings. Inverter Block disables the inverter at a set time period - ie. When conserving battery power is more important than running loads. Charger Block prevents utility power from being used for battery charging during peak billing periods. Remote monitoring and configuration with the Conext ComBox. Excellent load start capabilities with high 30-minute and 5-second surge power Harness the continuously declining production cost of solar power Designed for reliability. Robust design through rigorous reliability testing (HALT) Flexible. Available in 24VDC and 48VDC models. All models support both 50Hz and 60Hz output. Stack two units to double output power up to 8 kW. Intelligent functionality enables self consumption with solar prioritization, peak shaving and, assisting small generators with heavy loads Easy to service. Monitor, troubleshoot or upgrade firmware with the Conext ComBox. Replaceable boards and spare parts Easy to install. Companion breaker panels integrate inverter with battery bank and solar charge controllers. Mounting bracket design makes hanging inverter on the wall easy. Any product you return must be in the same condition you received it and in the original packaging. Conext SW is a pure sine wave, inverter/charger system with switchable 50/60 Hz functionality available for both 120/240 VAC or 230 VAC models. Sellers: Add a FREE map to your listings. 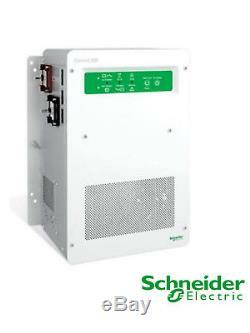 Schneider Electric Conext SW 4024 Inverter Charger 120/240V. The new Schneider Electric Context SW 4025 Grid Tie inverter has been redesigned to offer improved reliability and a low installed cost through ease of installation and integrated features. Companion switchgear integrates inverter with battery bank and solar charge controllers. All models stackable and support both 50 Hz and 60 Hz output. Available in 2.5 or 4.0kW, 120/240V or 230V. Maximum continuous power voltage range. Selectable 50 or 60 Hz. Charging output voltage operation range. Three-stage (Bulk, Absorption, Float) Two-stage (Bulk, Absorption). The item "SCHNEIDER CONEXT SW4024 BATTERY INVERTER OFF GRID SINEWAVE 3400W 24VDC 120/240" is in sale since Friday, September 1, 2017. This item is in the category "Home & Garden\Home Improvement\Electrical & Solar\Alternative & Solar Energy\Chargers & Inverters". The seller is "hurricanewindpowercom" and is located in Roanoke, Virginia. This item can be shipped to United States, Canada, United Kingdom, Denmark, Romania, Slovakia, Bulgaria, Czech republic, Finland, Hungary, Latvia, Lithuania, Malta, Estonia, Australia, Greece, Portugal, Cyprus, Slovenia, Japan, China, Sweden, South Korea, Indonesia, South africa, Thailand, Belgium, France, Hong Kong, Ireland, Netherlands, Poland, Spain, Italy, Germany, Austria, Bahamas, Israel, Mexico, New Zealand, Singapore, Switzerland, Norway, Saudi arabia, Ukraine, United arab emirates, Qatar, Kuwait, Bahrain, Croatia, Malaysia, Brazil, Colombia, Panama, Jamaica, Viet nam.